On any given day, Associate Patty Wischnowski — a registered nurse — can be found working along side Viatorians. 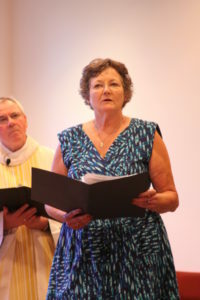 At her home parish, Maternity of the Blessed Virgin Mary Church in Bourbonnais, Wischnowski works in pastoral outreach and is a Eucharistic minister. Over her many years as a parishioner, she has led three medical missions to Belize and developed a health ministry at the parish. Meantime, she is just as active at the Viatorian Province Center, where during the week she accompanies retired Viatorians to doctors’ visits and errands, assists the CNAs, and all while helping out with making the residence — a home. Specifically, Wischnowski is known for hosting parties in the retirement wing. Not raging all-nighters, exactly, but she decorates for the season, makes hors d’oeuvres and creates a trivia contest built around the holiday. 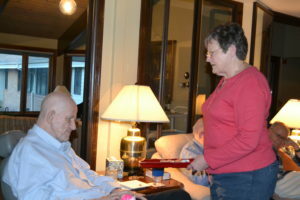 For major holidays, like Thanksgiving and Christmas, she even makes the holiday meal, often working with Br. 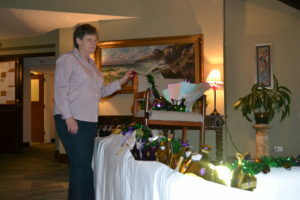 Don Houde, CSV, to prepare the menu and decorate the dining room. Wischnowski is a trusted friend to many of the retired Viatorians, since she has been a lay associate for 15 years. Most recently, Wischnowski created a Mardi Gras bash, complete with a decorated float for the “king,” beads, feathers and a trivia contest, of course. “It creates conversation,” she says whimsically. It turns out that Wischnowski, a native of Miami, attended nurses’ training at the 3,000-bed Charity Hospital in New Orleans. She lived and worked in the Big Easy until 1970, when she moved to Kankakee and her relationship with the Viatorians began.